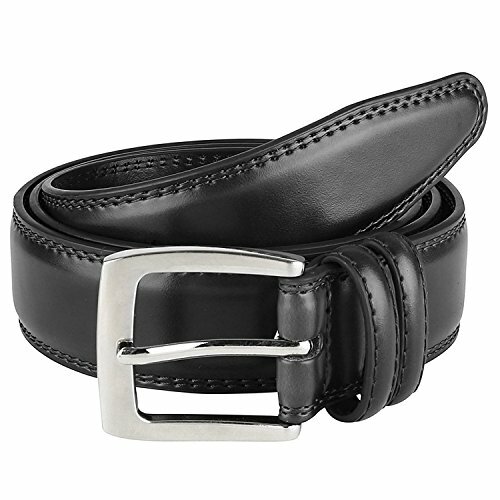 Men's Dress Belt Leather"ALL" Genuine Leather 35mm - Black (44) | What Should I Say? The right belt can round out a man’s head-to-toe ensemble, Prospero Comfort Men’s Classic Dress Belt will convert “your” belt from being just an accent piece into a centerpiece of your clothing! There are two methods to determine belt size. "Method 1" The most widely used method is to buy a belt that is 1-2" larger than your pants size, or as some say: ONE SIZE UP. Example, if you wear a size 36 pants, you would order a size 38 belt. We do not make odd sizes (33, 35, 37, etc.) so you would have to go with a belt that is 2" larger. If you wear an odd size pants, say a size 37, and sticking with the 1-2" rule, you too should order a size 38. Again, we do not make odd sizes, and a size 40 would be 3" larger, or too big. "Method 2" Measure a belt you currently wear. Measure from inner end of buckle (where the buckle attaches to the belt) to the hole you are currently using (in general it’s the 3rd center hole). If this measurement is 42 inches, order a size 42 belt. Our belts are sized to the center hole. If you order a 42, it will be 42" to the third center hole. Fitting a belt to the center hole is important as it gives you the most flexibility with your belt. PROSPERITY & COMFORT MEETS TOGETHER - "Prospero Comfort" men's belts are constructed from the highest quality of 100% Genuine Leather, which ensures the quality comfortability and durability of the belt for a longer endurance and better upholding, you'll be able to use this belt for years to come! SIZE - "BE SURE TO ORDER 1 SIZE ABOVE YOUR WAIST/PANTS SIZE" Please refer to the size chart among the images for clear instructions, Prospero Comfort mens dress belts are available from size 32 to size 60 to include regular men's sizes plus big & tall sizes, Belt Strap width dimensions is approx. 35 MM which is 1.35 inches. FEATURES - "Prospero Comfort" genuine leather men belts features a elegant design with a classic smooth finish and beautiful carefully crafted stitching on top & bottom, a double loop to hold end of strap, a single prong buckle, so it goes great with dress or work uniform or formal wear to be worn for everyday use and for any casual occasions. DESIGN -The variety of colors and sizes to choose makes the "Prospero Comfort" Belts complement for dressing with any outfit to give you a sophisticated look and feel. If you have any questions about this product by Prospero Comfort, contact us by completing and submitting the form below. If you are looking for a specif part number, please include it with your message.